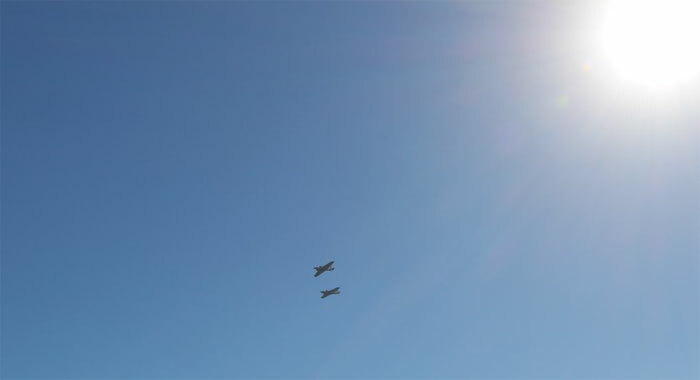 For the first time in more than four decades, three WB-57 aircraft flew together on Thursday. Here's a view from the ground at Houston's Ellington Field. The WB-57 is a stubby aircraft, with a 37.5-meter wingspan and just a 20-meter length. Each flight has a pilot, forward, and sensor operator. The first WB-57 begins taxiing. The last three flightworthy WB-57 airplanes in existence arrayed themselves on a runway near Johnson Space Center in Houston this past week, as if they were dinosaurs brought to life. The long-winged aircraft look something like prehistoric creatures, too, measuring just a stubby 21 meters long compared to an overly broad 37.5-meter wingspan. It had been four decades since as many as three of the great, superannuated birds soared together. But then they did. 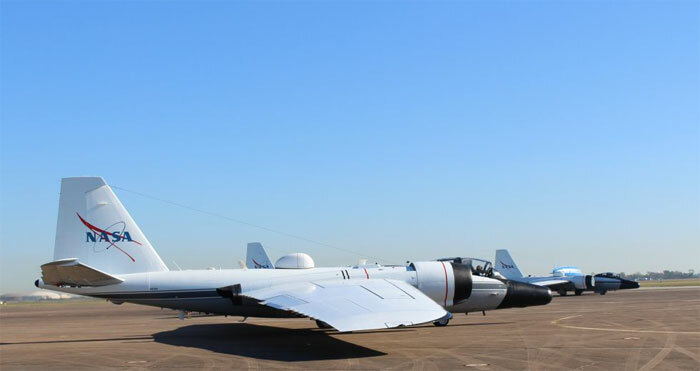 One by one, the WB-57s slowly rolled down the runway at Ellington Airport and then began a slow climb upward into resplendent clear, blue skies. 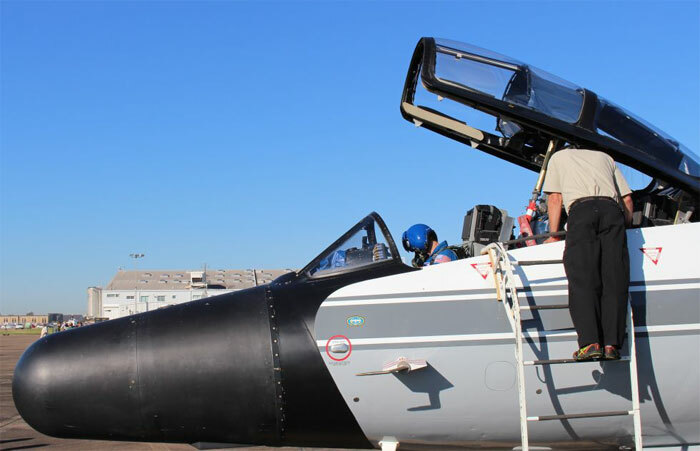 They flew again, thanks to a restoration program by NASA to bring a third WB-57 back from its boneyard. “It’s quite a day,” Charlie Mallini, who manages the WB-57 program for NASA, told Ars. Since 1972 NASA has flown WB-57s as part of a broad ranging science mission. Recently two of the aircraft flew high above hurricanes Joaquin and Patricia, major storms in the eastern Pacific Ocean. They have also flown missions as varied as collecting cosmic dust samples from comets and asteroids in Earth’s upper atmosphere, investigating clouds and studying the environmental effect of plumes from the Titan, Space Shuttle, Delta, Atlas and Athena rockets on the stratosphere. The B-57 line of aircraft dates back to 1944, when the English Electric Company began developing the plane. After the Royal Air Force showcased the B-57 in 1951 by crossing the Atlantic in a record 4 hours and 40 minutes, and becoming the first jet-powered aircraft to span the Atlantic without refuelling, the United States Air Force began buying them to replace its aging Douglas B-26 Invader. The aircraft performed bombing missions in Vietnam and other military campaigns, and a variant that later became the WB-57 was designed with longer wings that could fly even higher, up to 62,000 feet. This proved useful for weather reconnaissance and, around the world, to sample the upper atmosphere for evidence of nuclear debris where US officials suspected the atmospheric testing of nuclear weapons. 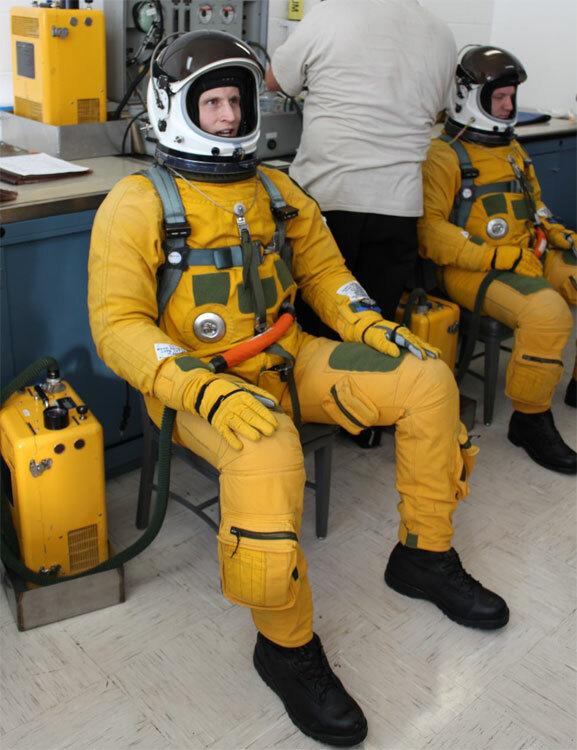 Before a high-altitude flight the pilot, left, and sensor officer must don their pressure suits. Here's a look at how the process goes. 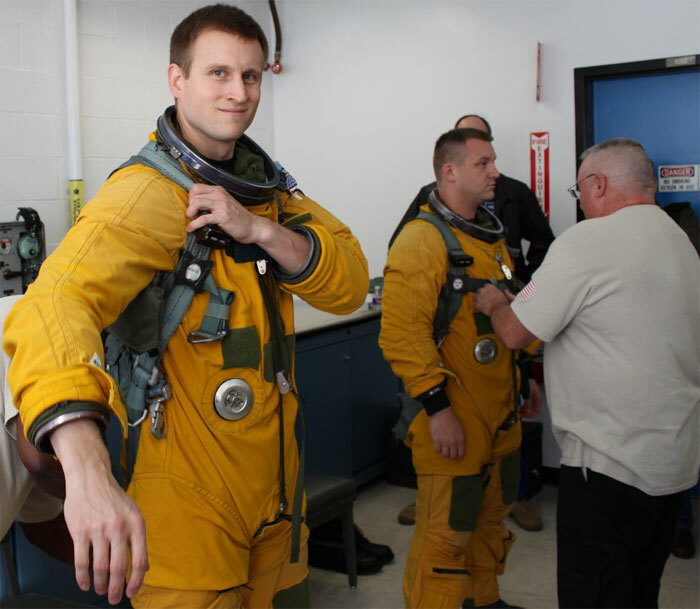 The suits come in 12 different sizes and then are modified further to fit each crew person. NASA, and the Air Force, are big on checklists. This emergency checklist is conveniently located in case the crew have to eject from the aircraft. Best to make sure the helmet has a tight seal. 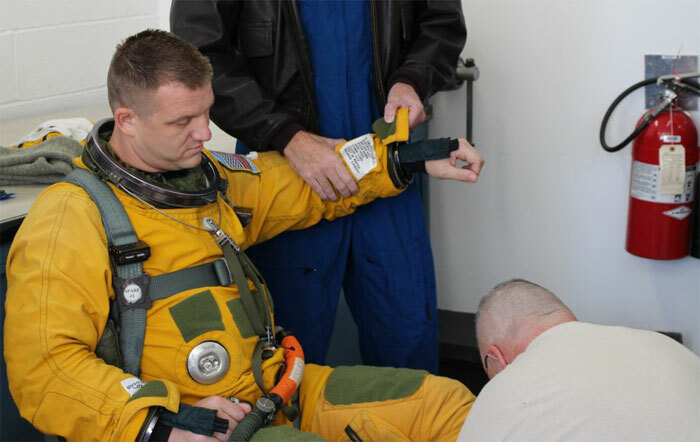 The suits need to be fully inflated to test their integrity. 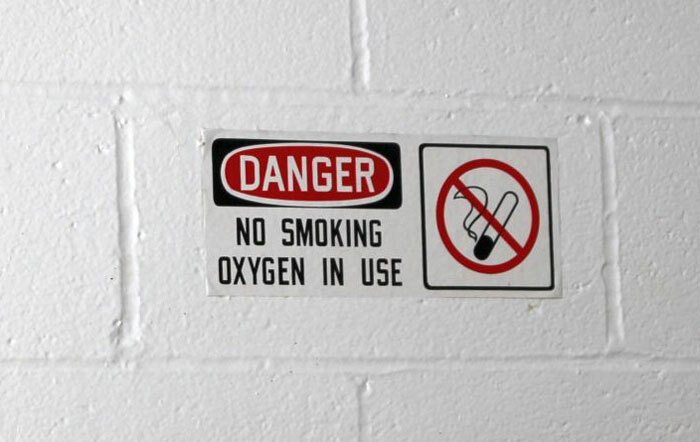 Always good advice when you're working with pure oxygen. 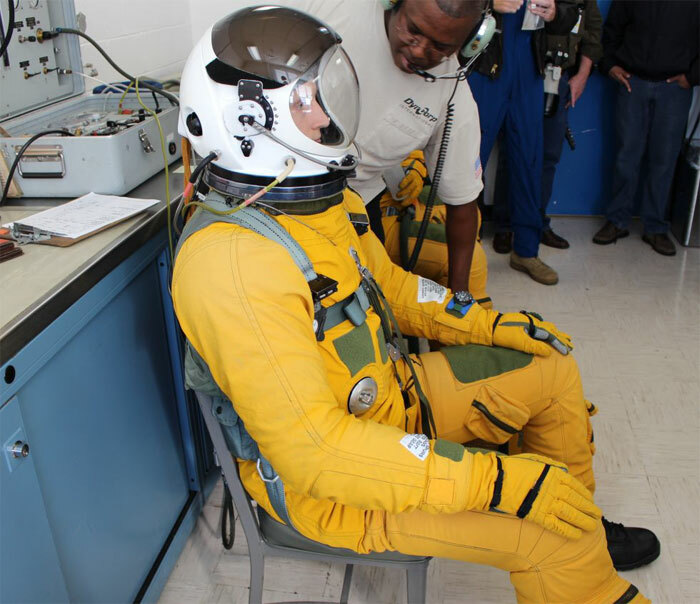 When fully inflated the pressure suits are rigid, like an overfilled balloon. Only these suits don't pop. 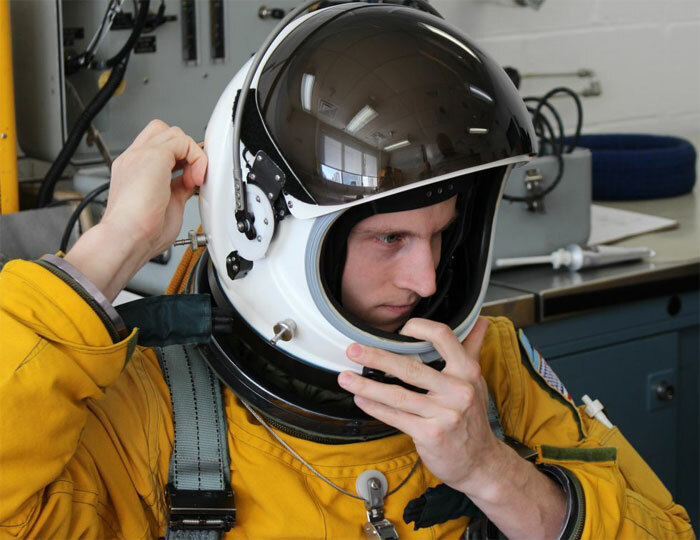 How do you eat in a pressurized suit? Through a tube. After six hours of flying, 10 cups of coffee's worth of caffeine in a tube comes in handy. Don't worry. 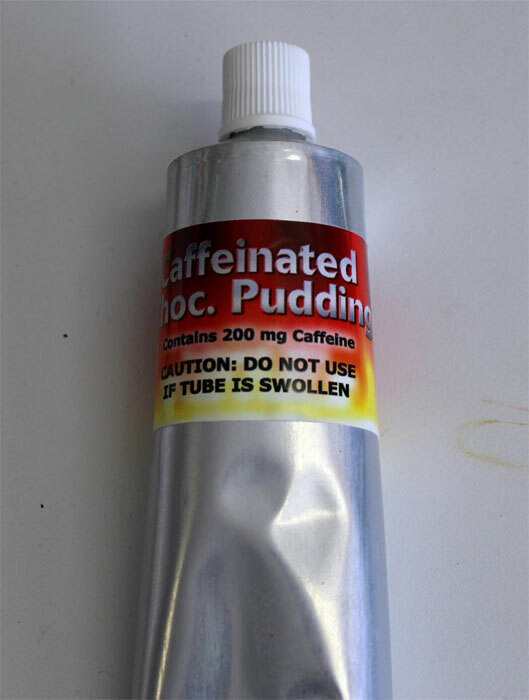 If you don't like caffeinated chocolate pudding, there are a bunch of other flavors. As the Air Force began phasing out the planes in the early 1970s, NASA was interested in using them for its programs to study Earth. NASA acquired its first WB-57 in 1972, which was retired in 1982. It later obtained two more, which have continued flying until today. Then, in 2013, NASA found a third WB-57 in the “boneyard” at Davis-Monthan Air Force Base in Arizona. After two years of restoration, it returned to flying status. This plane, now known as NASA 927, set a record—more than four decades—for the time between its mothballing and return to flight. 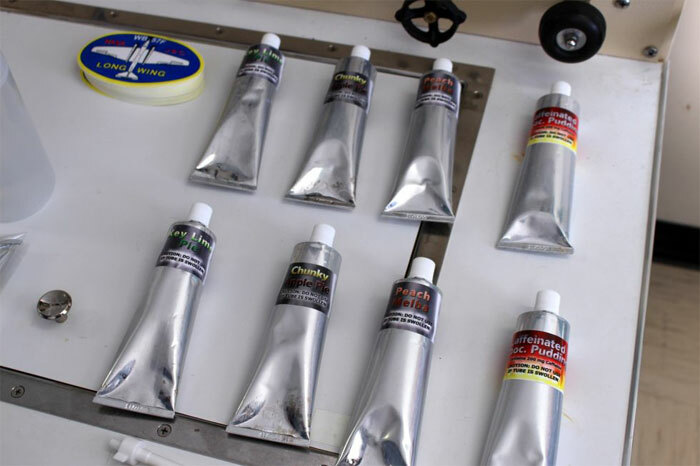 For some replacement parts, Mallini said, NASA had to go to museums. Finally, last week, all three aircraft were ready to fly in tandem around the city of Houston, not at 62,000 feet, but at a much lower altitude so they could buzz the space center, downtown and the Astrodome. Under clear skies they put on a spectacular show. After the fun, science missions resume next week.